on the four rules of flocking*: separation, alignment, cohesion, and avoidance. 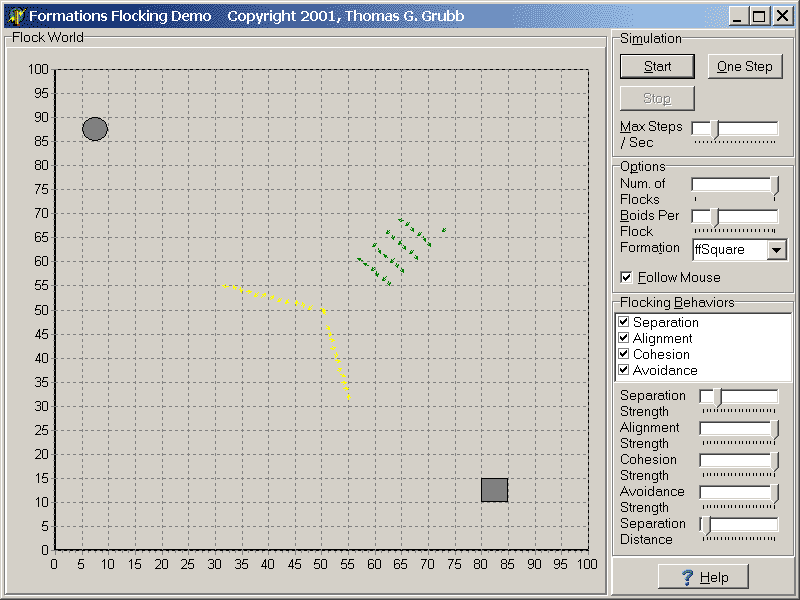 The Formation Flocking code modifies the standard cohesion and separation rules. The cohesion rule now moves the boid towards its position in the formation. turned way down to avoid the boids from pushing away from the formation. Finally, when a boid gets into position, it stops. Each flock is drawn in a different color. is added just to have enemies to avoid. They do not move. will rotate to face the mouse and then move towards the mouse. this software. No guarantees or warranties. article, "Flocking: A Simple Technique for Simulating Group Behavior,"
which is found in the book, Game Programming Gems (a great book by the way). Note that with a TFormationFlock, a desired position have been added. (from its current position) and then advance towards the desired position. Part of the Flocking demo.